Tap: Add (Green) to your mana pool. Hi! I've playtested in casual groups quite a bit with Arcades, I'd like to offer up some advice. -I think he performs best in an aggro shell. This means you'll probably want to keep your curve low. 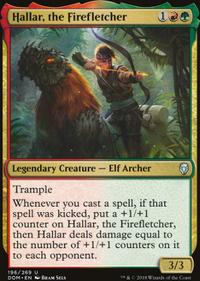 Creatures like Colossus of Akros and the like aren't going to do what you want them to do. 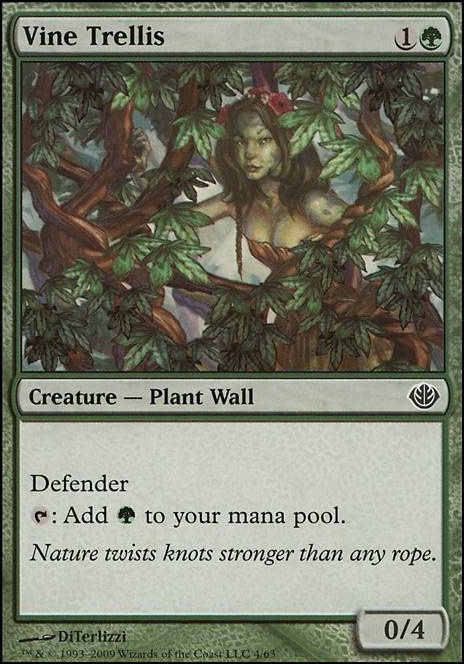 Remember, you're going to be drawing tons of cards, so you're likely to draw into more walls when you play one. You can play a 10/10, draw a card, and call it a day, or play a 0/7 and two 0/4, and draw three cards. Stacking 2 mana 0/4's and 3 mana 0/7's also means you'll be more likely to have stuff to do on early turns. -You don't need too much ramp, and the ramp you do keep, you're going to want available by turn 3, so you can get arcades out a turn early and start slamming walls on turn 4. That means the 1 and 2 drop dorks ( Sylvan Caryatid , Vine Trellis , Birds of Paradise , Noble Hierarch ) along with the signets, Mana Crypt , and Sol Ring ) will give you a healthy ramp package that should do the job. Farseek and Rampant Growth are fine cards as well. 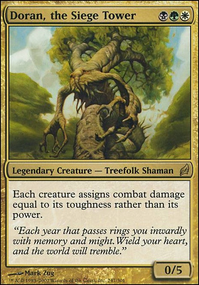 It's also worth noting that 3 mana ramp spells like Kodama's Reach and Cultivate are less good because they likely wont help you get arcades out early. - Worldly Tutor , Enlightened Tutor , and Mystical Tutor are all good, especially since you can draw whatever you tutor for with Arcades's ability. The more you play with your group and start slotting in situation-specific cards to deal with certain strategies, the more you'll start to appreciate these cards. -Creatures like Plumeveil and Colossus of Akros don't go well with power matters cards such as Meekstone and Slaughter the Strong . I would cut them and stick to low power. -Lands that come in tapped feel really bad in this deck. You'll find that putting yourself a turn behind can really screw you over. If you don't want to spend the money on fetches/shocks/duals, stick to pain lands, filter lands, City of Brass , and basics. -Aim for somewhere around 30-40 creatures, and 34-36 lands, depending on your mana curve. A surprise for me was that stuffing your deck with 50+ walls isn't actually the best choice, because a lot of the time a giant board is overkill and not what you need to win a game. Hope that helps! Here's my current list, if you want to take a peek.